Truth, it has been said, is the first casualty of war. 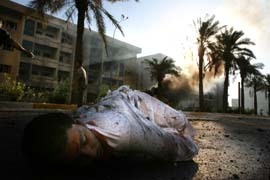 In the U.S.-led invasion of Iraq, official truth died months before the bombing of Baghdad began. Unembedded bears witness to the enduring power of independent journalism. In their unflinching look at war-ravaged Iraq, four freelance photojournalists show that life there is brutal yet poignant; that compassion co-exists with anger, hatred and fear. 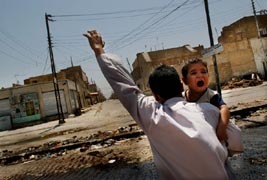 By gaining the confidence of Iraqi civilians and insurgents, these photojournalists have brought back images of life in wartime, from beauty parlors and joyful wedding scenes to the carnage of civilian casualties, the heartbroken faces of grieving parents, and the glassy-eyed shock of parentless children. This is not the view from a Marine base. These photographers were on the streets of Baghdad when it fell, amid a crowd of civilians under aerial attack, and in the holy Imam Ali shrine with the Mahdi Army during the siege of Najaf. Their images document issues often underrepresented: the insurgency as seen from inside the separate resistance movements, civilians affected by the battles between U.S. and insurgent forces, growing conservatism and fundamentalism and their effects on women, and the devastating effects of ongoing civilian casualties. Working outside the U.S. military’s official “embedding” program, the authors bring us face-to-face with the people of Iraq. They combine photographs and essays with excerpts from two years of personal letters, journal entries, and feature stories to take us across front lines and cultural barriers into the lives of a nation in crisis. Theirs is a path to understanding the cost of war. 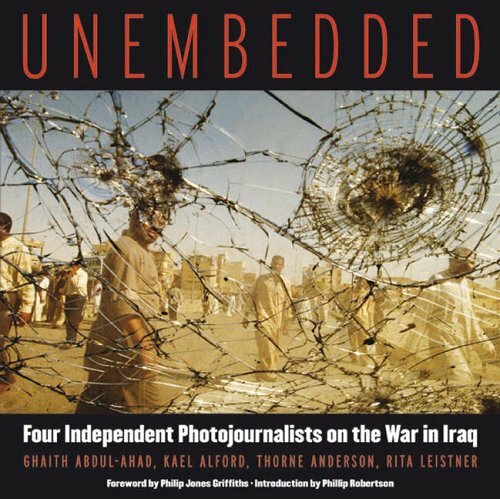 These photos appear in Unembedded: Four Independent Journalists on the War in Iraq. Unembedded bears witness to the enduring power of independent journalism. In their unflinching look at war-ravaged Iraq, four freelance photojournalists show that life there is brutal yet poignant; that compassion co-exists with anger, hatred, and fear. During the battle between U.S. forces and the Mahdi Army militia for control of the holy city of Najaf, civilians were once again caught in the crossfire between U.S. forces and Iraqi insurgents. While many families fled the city at the start of the fighting, others stayed and found themselves trapped as the cordon of U.S. trips tightened around the old city. At the heart of the ancient city among the twisting alleyways was the shrine of Imam Ali, the holiest site in Shia Islam, which the Mahdi Army was claiming to defend. With heavy bombardments during the night and small arms fire and lighter bombing during the day, those civilians left stranded in the city lived in constant fear. During a lull in the gunfire, this man decided to risk an 11th-hour escape. He raised one arm toward sniper positions and held his screaming child in the other, walking across the front lines on a main avenue to escape the final hours of the battle. Born in Middletown, NY, 1971. Kael Alford is a freelance photojournalist who has spent more than eight months of the last year and a half in Iraq. She was based in Baghdad during the U.S. invasion of Iraq in 2003. Her recent work from Iraq focuses on the growing culture of resistance, conservative religion, and the grass roots movements developing since the invasion of Iraq. Kael has worked extensively covering culture, politics and conflict in Southeast Europe and the Middle East for many major US and European magazines and newspapers. She is based in Amsterdam and New York and is represented by Panos Pictures in London. When I arrived at Haifa Street I was told that an American vehicle had been attacked earlier in the day. The American soldiers had been evacuated, but a crowd had gathered around their burning armored vehicle. Suddenly, there were two big explosions from an American helicopter attack and people started running toward me in waves as I ran up to the burning vehicle. A dozen men formed a circle around five injured people lying in the street, all of whom were screaming and wailing. I had been standing there taking pictures for two or three minutes when we heard the helicopters coming back. Everyone started running, and I didn't look back to see what was happening to the injured men. I had just reached the corner of a concrete cigarette stall when I heard two more explosions. I felt hot air blast my face and something burning on my head. Six of us squeezed into a space behind the stall less than seven feet wide. Blood started dripping on my camera and all that I could think about was how to keep the lens clean. A man in his forties next to me was crying. He wasn't injured, he was just crying. The helicopters wheeled overhead, and I realized that they were firing directly at us. I wanted to be invisible; I wanted to hide under the others. Born in Baghdad, Iraq, 1975. Ghaith Abdul-Ahad studied architecture at Baghdad University. A deserter from Saddam Hussein's Iraqi army, Ghaith lived underground in Baghdad for six years. He began making street photography in 2001 and determined to document conditions in Baghdad during the war. The day after the fall of Baghdad, Ghaith satisfied an aching curiosity by walking into one of Saddam's palaces, talking his way past American guards by claiming to be a foreign journalist. Soon after, Ghaith began writing for The Guardian and The Washington Post. His photographs began to appear in The New York Times, The Times (London), and others. 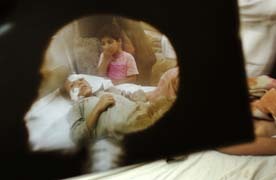 Ghaith was wounded by shrapnel to his head when U.S. helicopters fired rockets into a crowd of civilians on Baghdad's Haifa Street in September 2004. Of the six people seeking shelter from the attack behind a small street kiosk, Ghaith was the sole survivor. 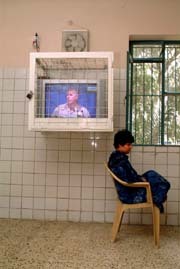 Patients at Baghdad's Rashad Psychiatric Hospital had few activities to occupy them. One was watching television, which included the Coalition Provisional Authority's daily live broadcasts and updates to the press. On this day, General Richard Myers, the Chairman of the Joint Chiefs of Staff, was fielding questions on how he proposed to address the rising insurgency, especially Muktada al-Sadr's Mahdi Army. Myers underplayed the threat of the insurgents. A few months later, the hospital grounds would shake from nearby bombs, and mortars would land in its courtyard as Coalition Forces fought the Mahdi Army right outside the hospital gates. Born in Toronto, Canada. Rita Leistner is a graduate of the International Center for Photography in New York, and has a master's degree in comparative literature from the University of Toronto. She spent 10 months covering the war in Iraq between April 2003 and September 2004. With a focus on in-depth, long-term projects, her feature work includes a profile of an American cavalry unit during a three month embed in the spring and summer of 2003, a portrait story of women residents at the Al Rashad Psychiatric Hospital in Baghdad, and a feature on the gravediggers at the cemetery of Najaf during the August-September siege of 2004. She often writes as well as photographs her stories. Her photographs and stories from Iraq have been published in The Walrus, Newsweek, Time, and Rolling Stone, among other publications. Falluja is in ruins now, but bitter seeds were sown there from the earliest days of American occupation. In September 2003, I heard about an American air strike on a village in the Falluja area. I visited the village and found a family from the Jumaili tribe in distress. Three members of the family had been killed in their home during the night. Some neighbors then took me to the Falluja hospital where family members crowded into the room of nine-year-old Hussein Ali Al-Jumaili. A doctor raised an X-ray to explain his injuries to the family and I photographed Hussein and his sister through the image of his fractured skull. Within a week after this incident, six more members of the Jumaili family--including two women and a one-year-old child--were killed by American forces in two additional incidents. Born in Montgomery, Alabama, 1966. Thorne Anderson has been covering international news with Corbis/Sygma since 1999. Thorne's photographs are regularly published in magazines and newspapers including Time, Newsweek, Stern, and others. He has spent 10 months of the last two years in Iraq and is among the few active journalists who worked in Iraq during the sanctions period before the most recent war. While covering the war itself from Baghdad, he was arrested by Iraqi intelligence and expelled from the country. He returned to Iraq as soon as the borders opened at the end of the war and has covered the nascent occupation resistance movements, both Sunni and Shiite. In Najaf, he and journalist Phillip Robertson spent three days inside the Imam Ali shrine with the Mehdi Militia and its supporters at the peak of the American military siege.